MARTIN, Tenn. – Amanda Mayo, a 20-year-old junior from Lilburn, Georgia, won the 2019 Miss University of Tennessee at Martin title during the combined Miss UT Martin-Miss Tennessee Soybean Festival Pageant held Sunday, Nov. 11, in the university’s Russell Duncan Ballroom. The pageant is cosponsored by the university and the city of Martin. The Miss Tennessee Soybean Festival crown went to Tera Townsend, 21, an audio engineering student at SAE Institute Nashville. Both titleholders now advance to the statewide Miss Tennessee Scholarship Pageant next June at the Carl Perkins Civic Center in Jackson. Townsend previously held the 2018 Miss Jackson title and competed in June at the Miss Tennessee Scholarship Pageant, so the Soybean Festival title qualifies Townsend to compete a second time for the Miss Tennessee crown. The Miss UT Martin Scholarship Pageant is in its 56th year, while the Miss Tennessee Soybean Festival Pageant crowned its 20th titleholder. The pageant is divided into five phases of competition, including private interview, swimsuit, talent, evening wear and on-stage questions. The contestant crowned Miss UT Martin receives $1,500 in scholarship money, and Miss Tennessee Soybean Festival receives $1,500 if she is a UT Martin student or $500 if she is not. Mayo is a double major in biology and geoscience as well as a member of the Skyhawk rifle team, and her platform is “Return to Learn: A Concussion Awareness Initiative.” She has competed for almost four years in Miss Tennessee preliminaries before earning this opportunity to compete for the state crown. Mayo plays the violin, but talent was not the most challenging part of the competition. “For me, the toughest part of the competition is swimsuit because I am plus-size, but I use that to influence other girls to let them know you can literally do anything if you just set your mind to it,” she said. Mayo’s UT Martin ties run deep: Her grandfather is university Athletics Hall of Fame member Lee Mayo, a kicker for the UT Martin football team that won the 1967 Tangerine Bowl championship. The Miss UT Martin court includes Rachael Friedrich, of Jackson, second runner-up, and Kailey Duffy, of Camden, first runner-up. 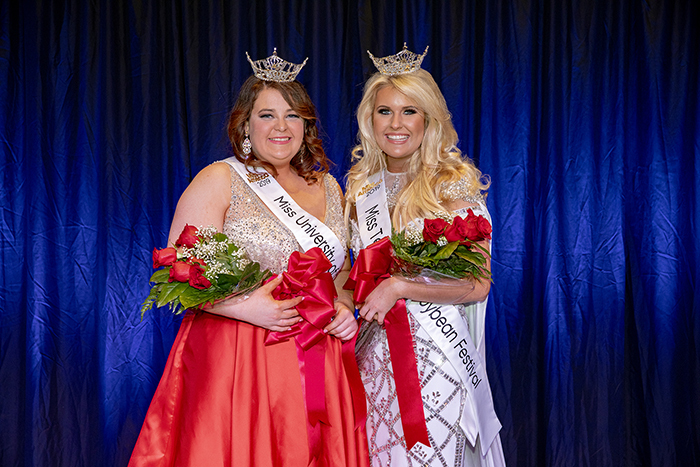 Miranda Colegrove, of Lake Jackson, Texas, was the Miss Tennessee Soybean Festival second runner-up, and Kara Smith, of Cordova, earned first runner-up and was also selected Miss Congeniality by the contestants. Sable Estes, of Trenton, won the People’s Choice Award. Katrina Cobb, assistant station manager for Public Television Station WLJT, is pageant director and was pleased with this year’s event. “It’s been an amazing night,” Cobb said after the event. “We had 13 young ladies compete. That’s the most any preliminary in the state of Tennessee has had so far this year. We’re excited to have two fabulous young ladies that have just been crowned … and I think it’s going to be a great year.” Cobb’s work will continue as she guides both contestants through Miss Tennessee Scholarship Pageant preparations and also accompanies Mayo and Townsend to Jackson next June during pageant week. The title of Miss Tennessee is a full-time, yearlong position as the governor’s official spokesperson for character education and as an ambassador for Tennessee’s Children’s Miracle Network hospitals. For more information about the Miss UT Martin or Miss Tennessee Soybean Festival scholarship pageants, contact Cobb at kcobb@wljt.org, or call 731-881-7561. PHOTO ID: Amanda Mayo (left), of Lilburn, Georgia, and Tera Townsend, of Nashville, claimed the Miss UT Martin and Miss Tennessee Soybean Festival titles, respectively, during the combined pageant Nov. 11 at the University of Tennessee at Martin. Mayo is a junior at UT Martin studying biology and geology. Townsend is an audio engineering student at SAE Institute Nashville.